In my Amazing Spider-Man #530 write-up, I mentioned some of the defining character differences between Tony Stark and Peter Parker as demonstrated by the first two parts of 2006’s “Mr. Parker Goes to Washington,” arc. In the storyline’s third and final section, ASM #531, these stark differences are even further fleshed out, especially in how the arc concludes. Even without having read nearly as many Iron Man comic books as I have Spider-Man comics in my lifetime, I’m well versed enough in the Marvel Universe to know that Tony Stark has made some questionable, often self-destructive decisions. He’s an admitted alcoholic and philanderer, who’s turned his back on friends, lost his company on multiple occasions, and made many enemies beyond just super-powered villains or CEOs of rival weapons/technology companies. And yet, Stark appears to have an understanding of the mantra Peter made famous: “with great power comes great responsibility.” It’s just that Stark’s narcissism makes his interpretation of personal responsibility vastly different than Peter’s. 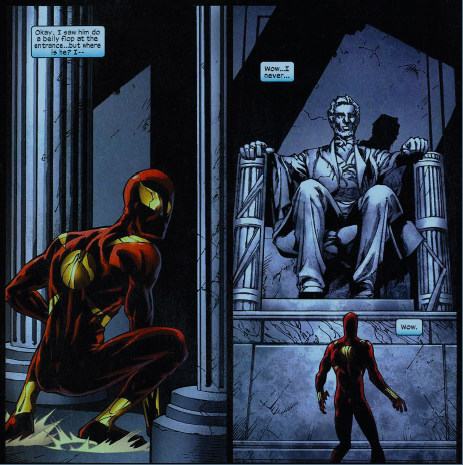 The scene at the Lincoln Memorial in ASM #531 says it all about Tony. After Spider-Man saves Stark from an apparent attack by his long-time enemy Titanium Man while the two are visiting Washington, D.C., to give testimony about the proposed Superhero Registration Act, Peter openly questions if the whole thing was a set-up by Tony to try and muddy the political waters driving the legislation. In a foretelling moment, Tony looks to Lincoln and essentially compares himself to the man many consider to be the greatest president in U.S. history. While I haven’t yet seen Steve Spielberg’s Lincoln movie, I have read Doris Goodwin’s Team of Rivals and have some basic background about his presidency. Lincoln was a man who believed in the preservation of the union of the United States of America beyond anything else and understood that his responsibility to a cause so great meant he would have blood on his hands while also having to turn to and align himself with some of his political enemies to create a strategy for the greater good. Ever since Tony Stark invented his Iron Man technology, he has fought a precarious battle between playing the role of hero, while also keeping his power to himself in fear that in the wrong hands, it could cause mass casualties and total chaos. He does this, even if it conflicts with the ideologies of some of his oldest friends like Captain America and Rhodey Rhodes. It’s not a perfect analogy with Lincoln, but there’s definitely something there. Peter, meanwhile, has a more selfless interpretation of power and responsibility. And, as we’re witnessing in the Spider-Man storylines today, Peter’s selflessness is often his undoing, like how he continually shows Dock Ock mercy which ultimately gives the villain an opening to switch bodies with Peter. Based on how the characters are portrayed in the “Mr. Parker Goes to Washington Arc,” it’s clear that Tony would never give one of his long-standing adversaries such an opportunity. 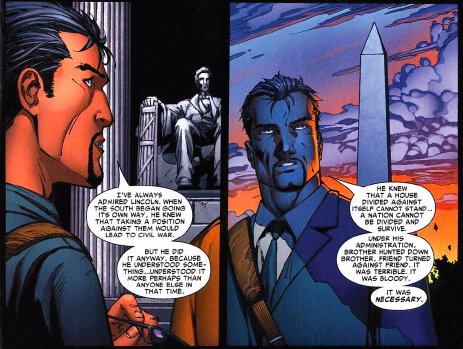 Like Lincoln, Stark takes the fight directly to whoever was the threat to the greater good. During the Civil War series, Tony eventually aligns himself with the government, even at the expense of a larger bloody war. 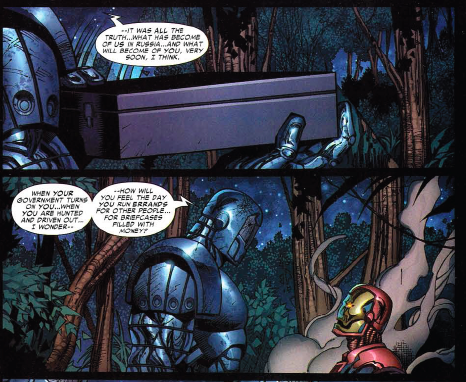 In this ASM arc, it is revealed at the end that Stark has partnered with Titanium Man, paying him off to make his presence known in Washington during the hearing and thus distract the politicians from the SRA (though the focal point would turn right back to the legislation after the disaster in Stamford we hear about on the final page of ASM #531). Despite seeking different results, in both cases, Stark is being highly manipulative and cunning. 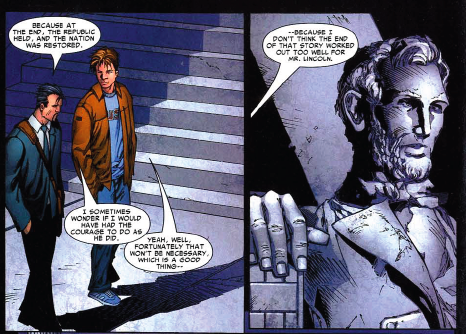 Peter is basically wise to it, but keep in mind, he talks about his admiration for Lincoln while at the memorial earlier in the issue. It’s a moment J. Michael Straczynski gives us to set up Peter’s ultimate manipulation via Tony in Civil War: when Stark convinces Peter to unmask himself . 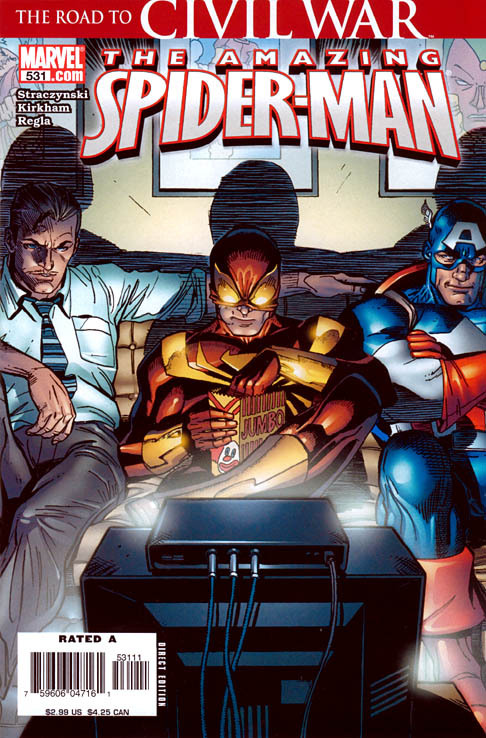 Because of Peter’s selflessness and naiveté, Stark is able to get Peter to believe that revealing his secret identity – something the character has long sought to protect going back to the very first issue of Amazing Spider-Man in 1963 – would be for the greater good. It’s at that moment where Peter and Tony’s interpretations of power and responsibility, which seem so different in ASM #529-531, become aligned (before, of course, Peter goes in his own direction and joins the fight against the SRA). Obviously, as a Spider-Man fan, I’ll always prefer Peter’s version of power and responsibility over anyone else’s. But it’s interesting to look back on this storyline and get better context about the period where ASM drew its influences directly from the world of Iron Man. It’s just another demonstration about how nuanced the Marvel Universe potentially can be – where just the slightest ideological shift in a character’s thinking (power and responsibility Spidey’s way vs. Tony’s way), can change the entire tone of a story, and the entire course of events in character’s life.